Dynaflex epoxy/glassfibre sailbattens offer an excellent balance of lightness, rigidity and durability. These sailbattens are constructed with unidirectional and crosslinked glassfibers in a special epoxy resin matrix which gives rigidity yet flexibility to the profile. Test have shown that compared to vinylester our special epoxy resin is 30% stronger when the load to number of cycles is evaluated. All our sailbattens are precisely tapered on our custommade machine to ensure a smooth profile. Our goal is to develop sailbattens which are light, durable, excellent bend characteristics and high reflex responce to absorb the forces on the sail and create a perfect aerodynamic foil! 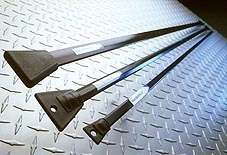 Dynaflex sail battens are guaranteed against defects in materials and workmanship. We can, however, accept no reponsibility for our product if it is used in any way besides which it was intended. Under no circumstances shall our liability exceed the original purchase price.